It took me three trips to Rome to finally manage a visit to the Catacombs of Priscilla, the two previous attempts subverted by bad timing. It turns out that the Catacombs had been closed for five years for restoration work which was completed at the end of August, 2013. I had no idea the Catacombs had been closed for so long and how lucky I was to gain access shortly thereafter. I can say that by the third time I traipsed out to Via Salaria, I had the route down pat. Whether or not the waiting made my visit more precious, the site is indeed a marvel. Dating back to the late second century C.E., the catacomb of Priscilla is the oldest Christian cemetery in Rome and best preserved. Though several legends suggest that the Priscilla from the New Testament, friend of the apostle Paul, was associated with the catacombs, scholars have debunked this myth. It takes its name from Priscilla, the mother of the Senator Pudens in whose house the apostle Peter, according to ancient tradition, found refuge. Priscilla likely donated a portion of her family land, once a stone quarry, as a burial place for the early Christian community. 40,000 tombs have been uncovered, many left undisturbed. On account of the fact that seven early popes and many martyrs were buried in the cemetery, it was known as the “Queen of the Catacombs” in antiquity. It is a common myth that early Christians used the catacombs as a place of hiding. The poor lighting and lack of storage makes it unlikely they made the underground graveyards their hideouts. Of greatest interest to me were the frescos. The most controversial fresco of the catacomb is the Fractio Panis. Some scholars believe that it illustrates a female priest breaking the Eucharist bread and giving it to the other women around the table. This is used as an argument for the ordination of female priests in the Catholic Church. Some believe that this represents a funerary meal instead. Others belive that all seven people seated at the table are men. The official guide book states that the gathering includes one woman. Archaeologist Dorothy Irvin has studied the frescos of this catacomb extensively. She notes that the seven baskets lined up on either side of the central image were a common symbol of the Eucharist in the early church. Women were chastised by the Church Fathers for leading early Eucharists so the depiction of one is not unthinkable. In addition, there is no food on the table other than the bread, only eucharistic elements, therefore it could not be an agape meal open to the entire Christian community regardless of gender. 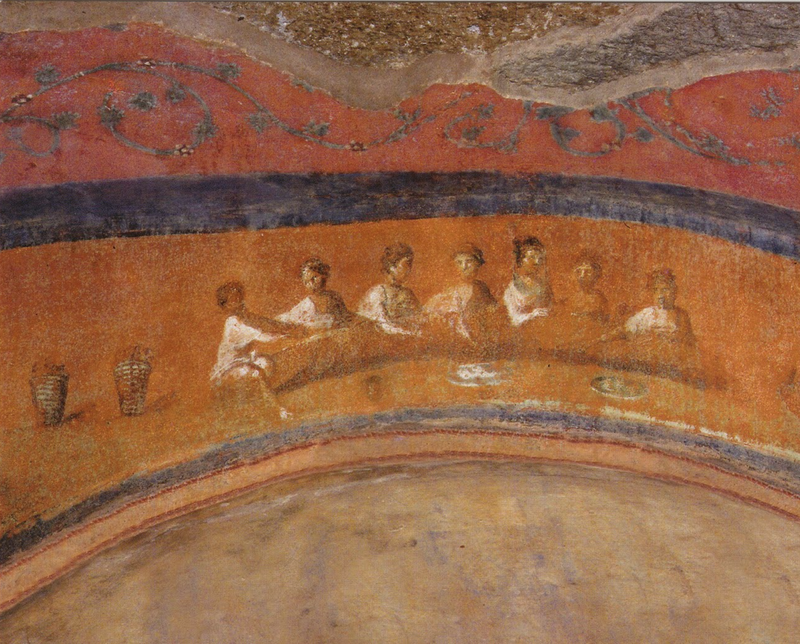 A close look at the fresco shows that the participants are all women. “One wears a veil, and they are all characterized by upswept hair, slender neck and sloping shoulders, and a hint of earrings. The arrangement of the hair, in fact, in comparison with datable coins depicting emperors’ wives, has been an important factor in dating this fresco to the end of the first century AD, that is, to a time when the New Testament had not yet been completed” (Irvin, p. 83). In other words, early Christians did not exclude women from the priesthood and episcopate. Their exclusion would become a later development. 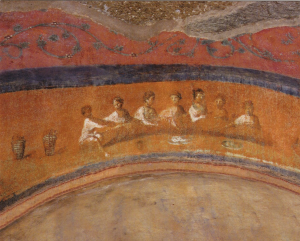 Another fresco in the catacomb has been described by some scholars as a “woman being celebrated, consecrated, blessed for some kind of leadership role” (Chris Schenk as quoted by Fincher). “In the Catacomb of St. Priscilla, is a fresco, dated about 350 A.D. that depicts a woman deacon in the center vested in a dalmatic, her arms raised in the orans position for public worship. On the left side of the scene is a woman being ordained a priest by a bishop seated in a chair. She is vested in an alb, chasuble, and amice, and holding a gospel scroll. 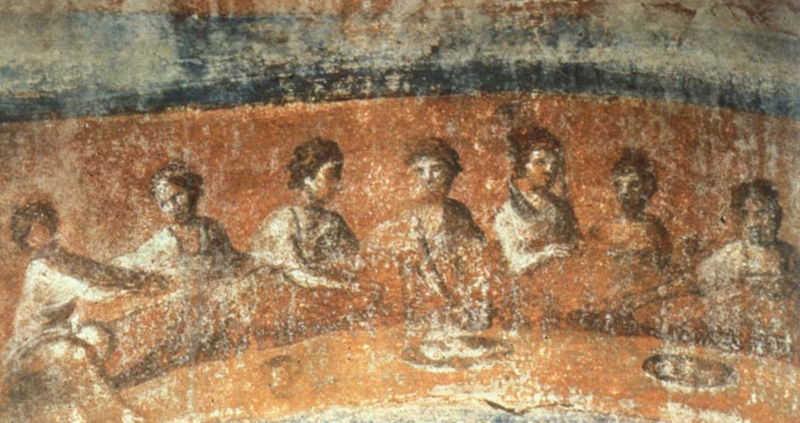 The woman on the right end of this fresco is wearing the same robe as the bishop on the left and is sitting in the same type of chair.” The woman in the center “depicts a woman deacon in the center vested in a dalmatic, her arms raised in the orans position for public worship.” (Meehan). Not everyone agrees with this description of the fresco. 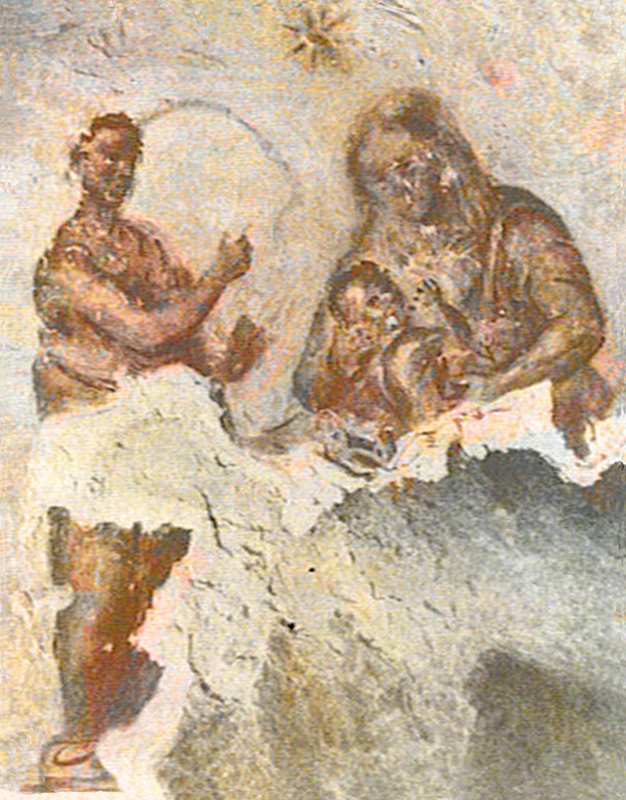 Most commentators suggest that the three scenes depicted in this fresco represent three incidents in the life of a young woman: her marriage on the left, her life as a mother on the right and the woman after death in the center. I tend to agree that the Velatio fresco does represent the ordination of a woman to a church office since there are so many other archaeological examples of this practice in the early church. Here’s a list of examples. Since I’m not Catholic or even Christian, I’m watching the debate over women’s ordination in the Catholic Church from the sidelines. But even from the sidelines I can see that an injustice has been done to religious women for centuries. Like the apostle Junia, early Christian women wielded a great deal more power and honor in the decades and centuries after Jesus’ death. Barrois, Georges – “Women and the Priestly Office According to the Scriptures.” in Thomas Hopko, ed., Women and the Priesthood (Crestwood, N.Y.: St. Vladimir’s Seminary Press, 1983) 39-60. Catholic Biblical Association of America’s Task Force on the Role of Women in Early Christianity – “Women and Priestly Ministry: The New Testament Evidence,” Catholic Biblical Quarterly 41 (1979) 608-13. Denzey, Nicola – The Bone Gatherers: The Lost Worlds of Early Christian Women (Boston: Beacon Press, 2007). Eisen, Ute – Women Officeholders in Early Christianity: Epigraphical and Literary Studies. (Collegeville, MN, Liturgical Press, 2000) Transl. from German original. Ide, Arthur Frederick – Woman as Priest, Bishop & Laity in the Early Catholic Church to 440 A.D.: With a critical commentary on Romans 16 and other relevant Scripture and patrological writings on women in the early Christian Church (Mesquite, Tex. : Ide House, 1984). Irving, Dorothy – “The Ministry of Women in the Early Church: The Archaeological Evidence” Duke Divinity Review 45 (1980): 76-86. Kalugila, Leonidas – “Women in the Ministry of Priesthood in the Early Church: An Inquiry” Africa Theological Journal 14, no. 1 (1985) 35-45. Kroeger, Catherine Clark – “Bitalia, The Ancient Woman Priest” Priscilla Papers 7, no. 1 (winter, 1993) 11-12. Osiek, Carolyn – ‘”The Ministry and Ordination of Women according to the Early Church Fathers,” in Carroll Stuhlmeuller, ed., Women and Priesthood: Future Directions (Collegeville: The Liturgical Press, 1978) 59-68. Rossi, Mary Ann – “Priesthood, Precedent, and Prejudice: On Recovering the Women Priests of Early Christianity. Containing a translation from the Italian of ‘Notes on the Female Priesthood in Antiquity,’ by Giorgio Otranto,’ Journal of Feminist Studies in Religion 7 (1991) 73-94. Swindler, L.S. and A., eds. – Women Priests: A Catholic Commentary on the Vatican Declaration (New York: Paulist, 1977). Ah, the interpretation of art! It’s an excellent reminder that the interpreter cannot leave their own world experiences out of the equation. Either perspective, matriarchal or patriarchal certainly changes the interpretation! Thank you for your insight. I enjoyed your post.